Tigers stars Todd Kane and Robbie McKenzie, with children from Eastfield Primary School. Hull City’s footballing stars surprised youngsters at one school as they helped spread an online safety message. 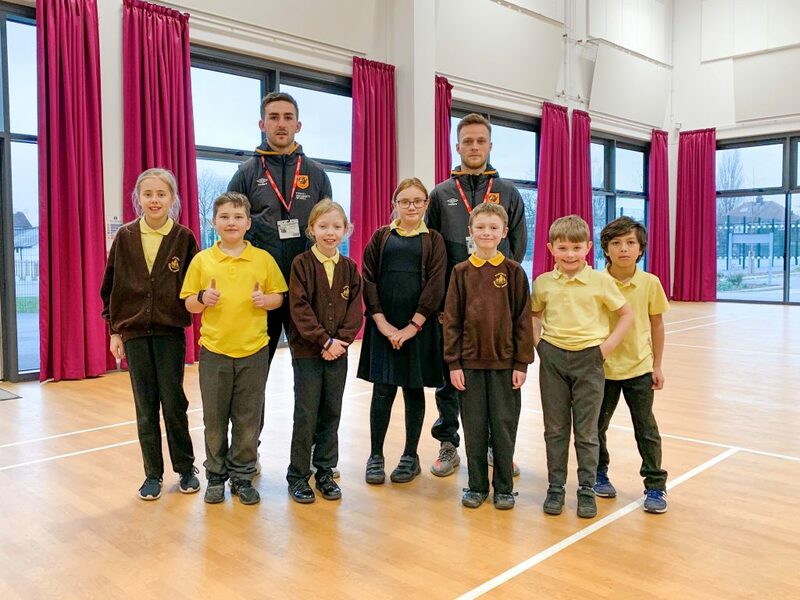 Tigers stars Todd Kane and Robbie McKenzie may be more used to defending on the KCOM Stadium pitch, but this week they turned their attention to defending against online dangers at Eastfield Primary School as part of Safer Internet Day. Year Six pupils at the west Hull school took part in activities designed by KCOM showing how to stay safe online before designing posters with online safety tips which were then judged by the footballers. The three winning posters will be displayed on the digital boards in the KCOM Stadium’s concourse on Tuesday, 12 February, for City’s match against Rotherham. Hull City star Todd Kane said: “I’m more than happy to take part in this event. It’s very important that children know about internet safety and what to do if they’re being cyber bullied. I know a lot of children look up to people like professional athletes and footballers so anything we can do to help them get the message by coming along and showing our faces is good. Year Six teacher Leanne Taylor said the day had made her students think more about the opportunities and dangers of being online. She said: “It’s been really good to see the kids so engaged and having a good time today. Subjects like internet safety can be a really dry topic but the activities that KCOM brought in helped to make it entertaining and bring it to life. Safer Internet Day is a world-wide initiative to help educate children, parents and carers to combat online dangers. As a supporter of online safety organisation Internet Matters, KCOM is able to point parents to a range of resources to help them manage their children’s online activity and deal with any problems they may encounter. Brendon Smurthwaite, KCOM’s community coordinator, said: “Keeping safe online and learning how to deal with issues such as cyber bullying is really important for youngsters today. “Events such as Safer Internet Day are great opportunities to give children the information and skills they need to make sure they can make the most of the opportunities the internet can offer, while avoiding the dangers. Be the first to comment on "Back of the Inter(net)! Hull City stars help youngsters stay safe online"